Can’t set Floating Point Numbers in the class-manager for em and pt. Missing rem as a unit also. 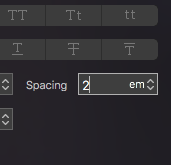 I’m still missing the possibility for setting floating-numbers for em-units. Integers don’t make any sense with em-units. Yeah, it’s coming, I still need to tweak a few things with the input numerical formattor. @horman this is coming today.